Did you see that video of the town crier announcing the engagement of Prince Harry and Meghan Markle? Yes, the happy couple are really going to have a royal wedding. 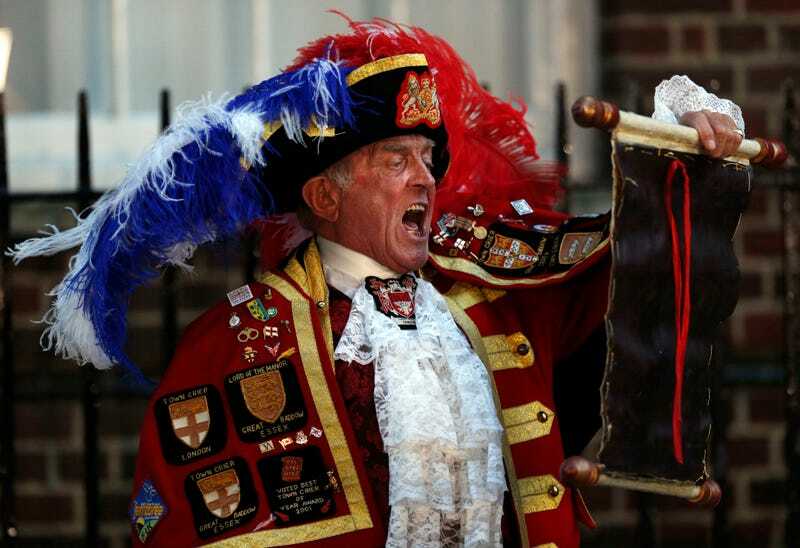 But that “town crier” is just a random guy dressed in goofy clothes and has nothing to do with Buckingham Palace. The self-appointed town crier, whose real name is Tony Appleton, has been around for years. He announced that a royal baby was on its way in 2013, and popped up again in 2015 when the baby was born. But again, he has nothing to do with the royal family, despite what some American news outlets might have you believe. ABC News posted an uncritical video of the dude and Business Insider did the same before changing its headline and story to acknowledge that Appleton has nothing to do with the royal family. And he’s fooled plenty of others in the past. So why does Appleton do it? Many people are wise to Appleton’s fakery, but that doesn’t stop plenty of American news outlets from seeing a guy in a tricorn hat and thinking, yeah this seems normal. And from there, it spreads like wildfire across social media. But I suppose it’s not entirely our fault. The idea of royalty is about as silly as this over-the-top town crier is anyway—though I guess no less silly than having a reality TV star as your president. Now that we mention it, the real danger might be President Trump seeing this goofball on the news and wanting a town crier for his own purposes. Hear ye, hear ye, fake news! Sad! I guess things could be worse.